BILSTEIN B8 gas-pressure shock absorbers offer the perfect performance enhancement to go with the sporty look of lowering suspension kits. 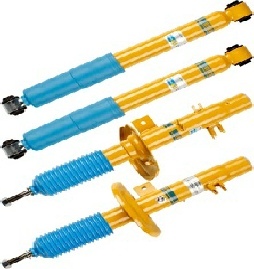 The specially shortened high-performance shocks guarantee the required spring tension for lowering springs and therefore support the sporting and dynamic driving experience. Available for 47 mm and 51 mm strut size. Please ensure you measure your vehicle correctly before ordering as we can not be held responsible for incorrect orders.